I just realised that the last few posts have been very blue! You can tell I'm drawn to those blues as Pool Party is my current favourite! So my blog's been a bit Island Indigo and Pool Party heavy, so I think it's time for a change. This is one of the exploding purses I made featuring the Elementary Elegance stamp set for the Inspiration Station at our Quarterly Meeting last Saturday. 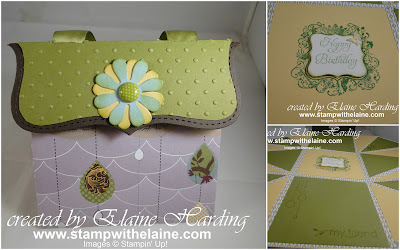 I also used the Pocketful of Posies Designer Series Paper in the Spring mini which coordinates with "My Friend" stamp set. When you open it out and lay it flat, you can drop in your photos and do a spot of journaling on some of the triangular pieces. Did you know that coloured Stampin' Emboss Powders are now available in the main catalogue on page 111? There are five colours available, Cherry Cobbler, Tempting Turquoise, Tangerine Tango, Wild Wasabi and Melon Mambo, 14g in each pot @ £3.75 per pot. I used this alot in my various projects to feature it, as it is so often missed in the accessories section. The flower detail is cut from Blossom Party originals die, another new die in the Spring Mini catalogue on page 15 and don't you just love those Designer Printed In Color polka dot brads? Hi Elaine. This is fabulous. Can I ask where you got the template from please? ?